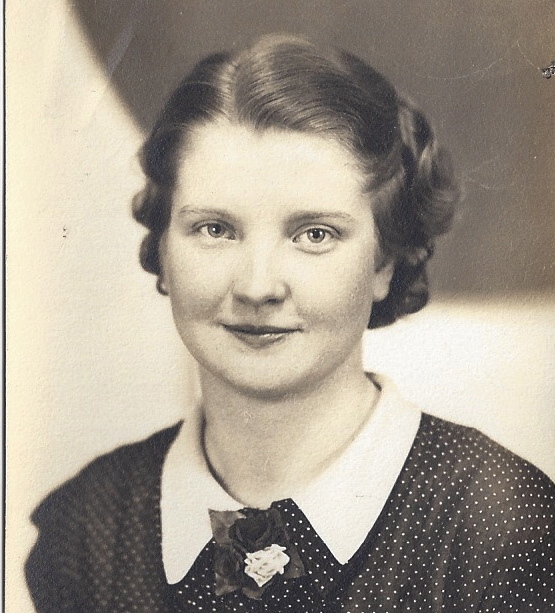 A Son’s Remembrance of His Mother on her Birthday: Frances Irene Floyd. March 4, 1914-September 18, 1967 | When I Survey . . .
Today is my mother’s birthday. She was born on this day in 1914, and died on September 18, 1967 at the age of 53 from cancer. She died too young. She would have been 96 today. Her older sister outlived her by 40 years. She’s died now too, as has my Dad, so there is hardly anyone who even remembers her. But I do. She most likely wouldn’t have died in this day of regular diagnostic tests and improved cancer treatments. But in the 1960’s cancer was considered by most people to be a death sentence, and usually was. Her doctor told us she had it, but asked us not to tell her, because the news would be so emotionally devastating she might lose hope. So in addition to having to deal with her dying, we had to lie to her. She was a smart woman and finally figured it out and made us tell her. I was eighteen when she died. She was told by her doctor in September of 1966 that she had about three months to live, and she said “Nonsense, I will live to see my daughter and son graduate (from college and high school, respectively) next spring, and she did, although she was in a wheelchair. My sister was engaged to be married, and the date was moved up to early September in the hopes she could participate. She couldn’t, since she was in the hospital dying. That day, my Dad, my younger brother, and I left immediately after the reception, still in our morning suits, full of champagne punch (at least I was), to visit her in the hospital with a fist full of Polaroid photos to show her of the wedding. She was delighted, but didn’t have much energy to enjoy them. A few days later I said my goodbyes to her (though far too much remained unsaid) and then I traveled 1400 miles away to go to college. Two weeks later she died, and I came home for the funeral. No single event in my life as her early death has had such an impact on the rest of my life. I often think of her on March 4. She said it was the only day of the year that was a command (“march forth!”), and when she was a kid she thought she was a big deal because she was born on Inauguration Day, but Congress moved that to January in 1933, so she lost that distinction. Though I often think of her on her birthday, it sometimes isn’t until later in the day. Some years I have forgotten it completely, and later in the week realized that I was sad on that day for seemingly no reason. But the heart often knows better than the mind. Mostly I think about what she missed. She never knew my wife, and my son and daughter. She never knew I graduated from college or became a minister. She never met any of her seven grandchildren or my brother’s wife. She was cheated. Her short life was in many ways remarkable for a woman of her generation. She was born in Oklahoma City and grew up in Wichita, Kansas, where she went to college, a rare thing for women in the 1930’s. She became a librarian, one of the few vocations open to women back then, along with teachers and nurses. After graduation she got a job at the Wichita Public Library. She was a dreamer and what we once called a “bookworm.” She always had her nose in a book, and expanded her rather conscribed universe through her imagination. Her parents were good people, pious Midwestern Protestants, and she lived at home with them throughout her mid-twenties, as unmarried women were expected to. But she wanted more out of life. She dreamed about far off places she had read about in books. She dreamed of the England of Jane Austen and Dorothy Sayers. And like many Americans in her day from the cultural hinterlands she dreamed of New York City, then in its heyday, where Dorothy Parker and James Woolcott could exchange bon mots in the Algonquin Club. It was a far cry from Wichita. By her late twenties she was considered an “old maid,” most likely never to be married. She wasn’t accepting any of this. So she decided to change her life. Against her parents’ wishes she applied to Columbia Library School (now sadly gone), arguably the best in the country, and when she got in, she went. She packed her suitcase and took the train by herself to New York, and got a room at the International House near Riverside Church and never looked back. She loved New York. Like so many people who go there she had big dreams. She wanted to be a writer, and scribbled short stories in her spare time. I have many of them. They are not particularly good, overly self-conscious and somewhat formal in style, but they are interesting and really not bad. She was a good writer, but she tried others’ voices and never found her own. She used to joke that she had rejection slips from all the best periodicals. One of her grandsons is a writer and won an O’Henry Award a few years ago for one of the years’ best short stories. She would have liked that. When she graduated from Columbia she got a job at the New York Public Library on Forty-Second Street, and went to work every day between the storied lions. There she got such a good reputation for cataloguing books that she was asked from time to time to do it for the Library of Congress. She became an Episcopalian, which I expect didn’t go down too well with her folks back in Wichita, in a day when anti-Catholicism was still an ugly feature of much of Protestantism, though to be fair, I never heard any of it from them. She met my Dad, a handsome intellectual Bostonian, while she was working at a summer job at the University of New Hampshire, where he was teaching while a Ph.D. candidate back at Columbia. They discovered they both lived in New York, and when they got back to the City they started dating, and eventually married. I am the second of their three children. My sister and I were born in New York City and my kid brother was born in New Jersey, where we moved when my parents realized that New York wasn’t a terrific place to raise kids, especially when you had limited means. Church was important to my mother and she was on the altar guild and worked on the annual bazaar, and baked pies for the Bake Sale, and if we were lucky she might make one for us. I thought of her the other day when I was in church. It was an Episcopal Church and the rector, who was celebrating, is a woman, as is the associate priest, as were the two acolytes. So the communion table was surrounded by women, and no one thought a thing about it. My mother would have liked that, although in her day it would have been a complete flight of fancy to imagine it. She was a proto-feminist in a quiet way. My sister went to Vassar when it was a women’s college, and my mom was very proud of her. Nearly thirty years later my own daughter graduated from Wellesley College, and I thought of my mother on that day, too, although she would have been equally proud of my son’s graduation, for she was nothing if not fair. And what would she make now of my daughter going to divinity school? When we were growing up in the suburbs she took a job as a librarian in a middle school nearby. Her students loved her and she encouraged them all to read, read, read. I suspect she often quietly overlooked a library fine on an overdue book if it was a hardship for the student’s family to pay it. I have now outlived her by 7 years, and she has been gone from my life for so long I can’t recall her voice, and I can remember her appearance mostly from old pictures. I sometimes glimpse something of her in the faces of my daughter and my two nieces, and see inklings of her ways when they labor at crossword puzzles or slaughter one another at Scrabble. I woke up in the wee hours this morning and started thinking of her and tears welled up in my eyes, even though she has been gone 43 years. So I guess I still grieve. But mostly I am grateful for the years I had with her. She gave me words, books, music, a dry sense of humor and above all, faith. She also gave me a lively sense of the communion of saints, and makes me acutely aware of our connection to those who have gone before us and help make us who we are. So here’s to you Mom. Happy Birthday! This entry was posted in Christian faith, dying, Faith, Frances Irene Floyd. Bookmark the permalink. Thank you for sharing this! My mother passed of cancer when I was 17, but no one knew it, not even doctors until an autopsy was done. She was not yet 40. I still cry and have the tears, for I was unable to say goodbye. I still miss her terribly, especially when life events happen. I do believe she would have really loved my daughter especially, but my son too. Good things to think about as we approach the Lenten season. Thanks for your comment, Nancy. Yes, that sense of missing them at special events will always linger. My daughter, whom she never knew, will be married in October, and once again, I will miss her. But she would be so proud. There is something distinctive about being a motherless child, whatever age you are. It’s not until you reach our stage in life that we reflect on how far in life’s journey we had the gift of our parents. And to reflect how old our children will be when we pass on and if we have been a gift to them. Thanks for your reflection, which undoubtedly will trigger remembrances among all who read it. Thanks, Bill. Since both my parents died young I sometimes feel like I am “playing with the houses money” and treasure the time I have with my amazing grown children. Each day of life really is a gift. This is an amazing post. Thank you, Richard, for putting the love of your mother into such a powerful expression with words. I am a new follower and you have blessed me already. I loved learning about your mother. Your words brought years to my eyes for my departed father who died nearly 5 years ago. Another great mentor. Thank you.